• Low noise and smooth tape dispensing. • Strong bonding tape fuses to almost any surface. 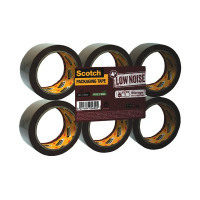 This Scotch packaging tape is ideal for sealing boxes, parcels, envelopes and more. Made from durable polypropylene, the tape is PVC free and low noise. This brown tape measures 48mm x 66m. This pack contains 6 rolls of tape.